A versatile seasoning made with real shrimp to boost the meatiness and aroma in your seafood dishes. 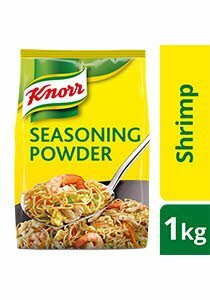 For Stir-Frying, Marinating and Seasoning: Use 15g of Knorr Shrimp Seasoning Powder for 1kg seafood for improved Flavour and taste. May also be used to season noodle dishes and broths. Made with shrimp meat and shrimp fat.